Rozemeijer Stabilizer Trace - this is simply a brilliant idea from a brilliant angler, made from the finest components, 316 grade stainless, Berkeley rolling swivels and powerlock snaps, all add up to a well constructed piece of kit. This trace alleviates the necessity for an anti kink vane which only complicates a predator trace. These are ideally suited for use with spoons, bucktails and spinners that normally generate line twist. With the use of these traces you eliminate line twist and prevent bite offs with one piece of kit. Available in packs of 2 of the same size or one of each size. ‘A’ after the number denotes ‘Standard American’ split rings. No letter after the number denotes ‘European’ split rings and in this case the number denotes the diameter in mm. Rozemeijer Spinning Trace - 7 Strand 316 grade stainless steel wire - wound spinning traces, manufactured with top quality swivel on one end and crosslock on the other. Available in 2 lengths, 2 weights and 2 colours, black and nickel. 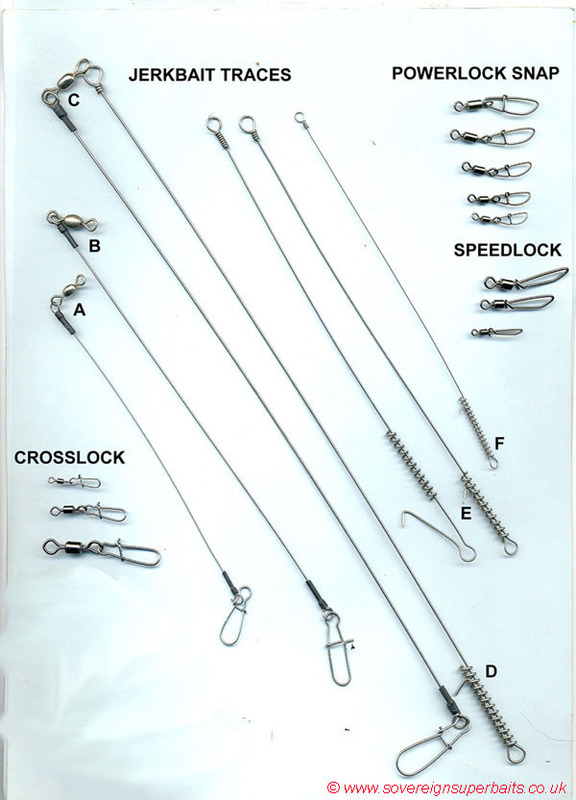 Hardware: Here we have a selection of jerkbait traces in 3 sizes, spinner / bucktail traces in 3 sizes, crosslocks, speedlocks, fastlocks and powerlock snaps. Theoretically something for everyone! All manufactured from top quality German steel to the highest possible standard at very sensible prices.